Build Africa is supporting young mums across Uganda, providing them with literacy and numeracy skills so that they can help their children thrive in school. In the implementation of this project, ‘Change the Story’, it is important to consider the cultural barriers that stop women receiving an education. This summer, I travelled to Uganda for ten weeks to speak to community members in four different villages in Oyam and Kiryandongo, where the project would soon be implemented. I was inspired by the dedication I saw there. The Build Africa staff and volunteers worked long hot days and travelled very far, often on motorbike, to reach the villages where they were working. My research focused on understanding how to engage men in promoting women’s access to education. I was keen to find out more about how gender roles were defined within the villages, and so I explored the perceptions of and attitudes towards men and women in relation to childcare and education. I spent a few weeks travelling to the villages, Alen and Kamdin in Oyam and Bunyama and Kankoba in Kiryandongo. In the villages I got to meet with some of the fathers and mothers in the communities as well as some of the youth and elders, people who would soon be involved in Change the Story. I interviewed health workers and head teachers, to get a broader idea of how men could be encouraged to participate in education and maternal healthcare. The findings of these discussions would allow Build Africa to better target men, and involve them in the upcoming project. 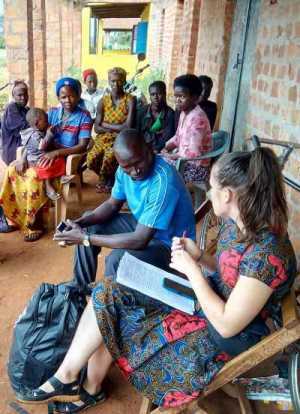 I spent a lot of time in Build Africa’s Masindi office, preparing data analysis tools, transcribing interviews and discussions from focus groups, and understanding the data collected. For example, I found that only 24.2% of men surveyed in the village of Bunyama accompanied spouses for their recommended number of antenatal appointments. During the discussions that I held with community members, it was frequently mentioned that parents could not support children with learning because they had not received the education and skills to do so. This highlights the need to improve the literacy and numeracy skills of mothers to improve the education of their children. Additionally, it became apparent that cultural attitudes do not align with men taking on a caregiver roles. In order to counter this, my research recommends familiarising men with the caregiver role through the engagement of cultural and local leaders and providing access to appropriate training guides and activities. A male caregivers learning curriculum will be developed, with key sessions on cultural, family and community practices. When men see themselves in these roles, women’s advancement will also be supported. Local experts will be involved in designing the content, as well as linking it to the literacy and numeracy curriculum that is under development. Orientation and writing of the curriculum has already started, and the final deliverable and training will come through by the end of February 2019. Through the gender empowerment classes, life skills training and lessons for male care givers, gender equity will be built. This will translate into the prioritisation of small businesses, which both men and women will have access to. During my trip I was encouraged by the work that Build Africa are carrying out in so many communities in Uganda. The Change the Story project is particularly needed, and will have an impact on entire families and communities as it is rolled out. I thoroughly enjoyed my time with them and was very sad when the ten weeks came to an end because Masindi already felt like home and the people there like family. The Change the Story Project is funded by UK Aid Match from the Department for International Development.